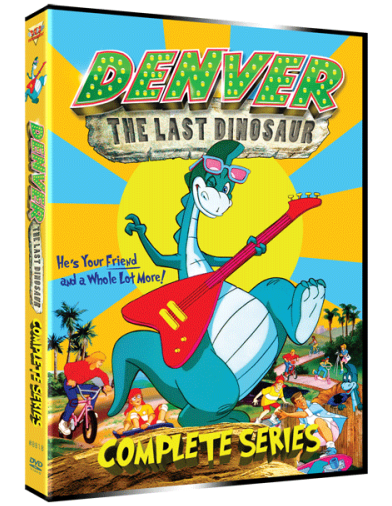 Rupert Pupkin Speaks: VCI Entertainment - DENVER THE LAST DINOSAUR - The Complete Series onDVD ""
DENVER was a show that remember catching in bits and pieces when a kid. Mostly I think I may have skipped past it on my way to other TV shows. I certainly remember the more-than-catchy theme song which memorably exclaimed that Denver was "my friend and a whole lot more". I think, for fourteen-year-old me, DENVER represented something a smidgen too "kiddie" for my soon to be expanding high school tastes. In retrospect I find this kind of ironic considering that I would later do my high school homework on weeknights with the television tuned to USA Cartoon Express. That said, I found my revisit to this late 80s animated series to be quite pleasant and oddly nostalgic. The nostalgia functioned on a couple levels. Firstly, I was reminded of how much I love cartoons from that period. There's just something about the way they were written, produced, and scored that is such a trip for me. It's like a time warp. I watch a lot of present-day animated fare with my daughter (5) and as much as there are plenty of interesting shows, it's just not quite the same. There's a lot more CG animation for one thing, which I don't really care for too much. 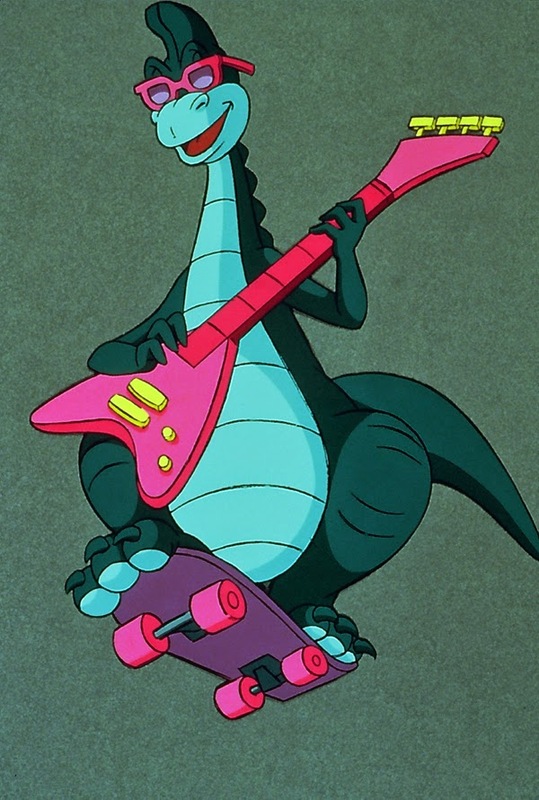 Anyway, DENVER is part of what seems to have been a push in the 80s to infuse cartoons with at least some tiny bit of educational material (in this case, info about dinosaurs). The other part of my personal nostalgia for DENVER comes from it's depiction of Los Angeles and California in general during that time. Not that it's in any way reflective of what that part of the country was like then, but it's still an interesting time capsule nonetheless. The kids that find Denver (in a preserved egg near the La Brea Tar Pits) very much represent some stereotypical California youth. A couple of them (especially 'Mario' and 'Shades') have a heavy "surfer dude"/"valley" kind of vibe. This is humorous to me partially because this kind of character shorthand seems silly, but also because I found myself moving to Los Angeles in 1999. While I have occasionally encountered a personage or two along the lines of these boys, it's been rare (which was disappointing to be honest). The other part of this "whoa dude" kind of representation that amuses me is that it reminds me of similar characters from other things like VALLEY GIRL ( the movie). I actually ended marrying a Valley girl in real life so my wife and are always amused and entertained with how folks from The Golden State are represented in movies and TV. Anyway, I digress. DENVER THE LAST DINOSAUR is a charming antiquity of a gone-by era and it's of course nice to see it in a complete set for as VCI has presented it here. Denver is a goofy yet lovable character who is always getting himself into mischief. The Los Angeles setting is intriguing in that some real L.A. landmarks occasionally crop up as well (The Hollywood Bowl, the Capitol Records building). I haven't seen too many cartoon shows set in a specific place like that so it's kind of a neat additional element. VCI's 6-disc set has 50 episodes (including the 46 min pilot and the Holiday Special) and also includes some special features which is a cool unexpected surprise. The supplements in this case come in the form of interviews and bonus cartoons. The interviews are with Ted Koplar (World Events Productions President), Bob Koplar (WEP Vice-President) and Jeremy Corray (former Creative director for WEP). All three touch on the iconic nature of Denver and why the show has remained endearing for so long. They also make a point to touch on how they plan to update DENVER for a new show they are developing. As for the bonus cartoons, it's a sampler platter of one cartoon each from many other VCI animation collections. This is a really neat set for nostalgic fans of 80s cartoons, but also might be cool to show your own kids now. Mine really took to it and we've both been singing the theme song for days now. Have a listen (below) and just try to get it out of your head! DENVER THE LAST DINOSAUR The Complete Series can be found at VCI's website and other online retailers.